Sailors from the guided-missile destroyer USS Laboon (DDG 58) traveled to Pittsburgh March 18-21 to visit the hometown of their namesake and members of his family. 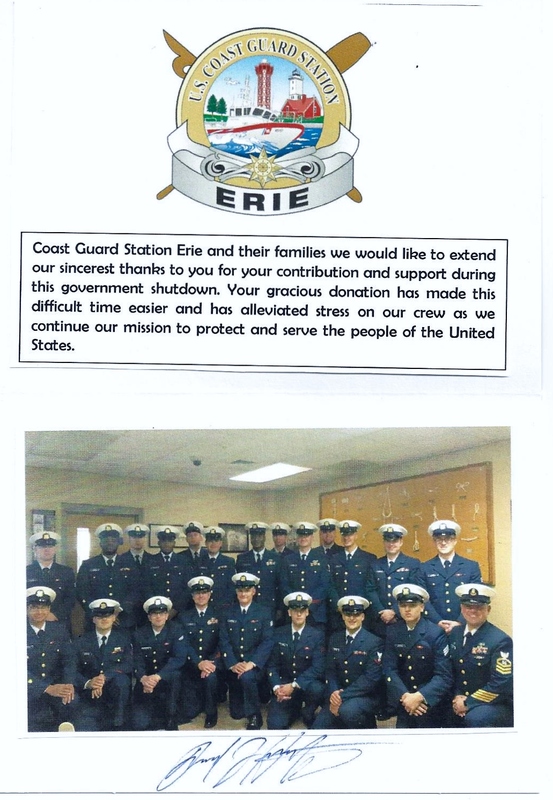 The Pittsburgh Council was in constant contact with the three Coast Guard stations in the Pittsburgh and Erie area, including weekly phone calls, visits and dozens of email contacts. The council also helped the Coast Guard locate local and national resources to assist them during the government shutdown, provided gas gift cards worth $1220 total and sponsored two Super Bowl parties. On Dec. 15, the Pittsburgh Council participated in the Wreaths Across America program, placing wreaths on cemeteries of local veterans, a wonderful opportunity to remember our country’s fallen heroes. In 2018, Wreaths Across America grew to include 1,640 participating locations across America - up from 1,433 the year before. There was an additional expansion overseas to include the placement of 9,387 wreaths at the Normandy American Cemetery. It is an honor for us to be a part of the national movement to pay honor to our fallen service members and their families in this way. We very much want to thank all who have participated in this program. Our council received funds from our support that will be used to further our mission. 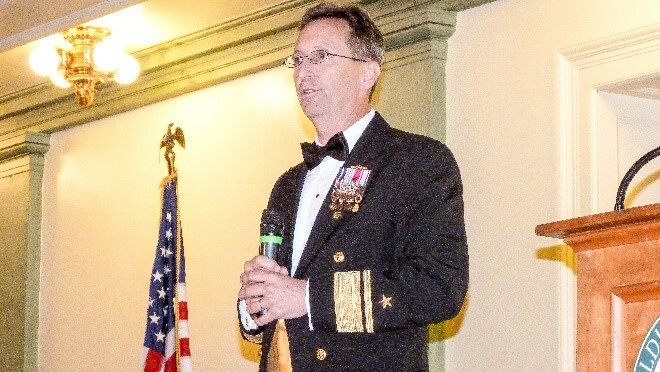 The Pittsburgh Council had a great Navy Ball in Pittsburgh on Oct. 12 with the theme “Forged by the Sea, Tempered by the Steel City.” Rear Adm. David Hahn, Director of Naval Research and past commanding officer of the USS Pittsburgh, was the guest speaker. This year was the first year in a long time that the Navy Ball was held in the ornamental gathering place where it had been held in years past. The great committee worked very hard to put together all the pieces that would make this work. Feedback from some of our core constituency had indicated that a central location would be more convenient and there are very few locations as nice and affordable as the main ballroom at Soldiers and Sailors. The benefit of having a place so closely tied to the Navy’s history in Pittsburgh was indeed a bonus. The staff at Soldiers and Sailors, the caterers from All the Best Catering and Eric Wenning from Wenning Entertainment bent over backwards to work with us to make this a great event. Nearly 200 tickets were sold and the crowd that gathered that night to hear Rear Admiral David Hahn (a former CO of the USS Pittsburgh) speak about the future of the Navy and its proud relationship with Pittsburgh. Lt. Sam Colton played a key role as Master of Ceremonies and kept the program on track and on time. LCDR Rick Elster, USN Ret., used the Table of Honor Ceremony to remind us of those who were not able to be in attendance because of their sacrifices. We had a special performance by Ms. Antolena Damico, who set the stage with a brilliant rendition of the National Anthem and kicked off the entertainment with two crowd pleasing songs. There are so many people to thank, including Captain Polly Bozdech-Veater for keeping the program tight and well scripted and Ensign Brooke Houle for her tireless work behind the scenes. If you saw one of the special coins we used to raise funds, you saw her work. It was her design that was used on all our branding. As a bonus, over 650 coins have been sold to date which helped to make sure we kept our budget in control. Thanks to McKeesport-Pittsburgh Chief Petty Officer’s Association and all the committee members for making this an evening to remember. Most of all, thank you to our many sponsors including Bill Wolffe, CFP, Fragrasso, USAA, Sarris Candy, John Van Huyck, Vic Hulina, Katherine Kersten, CWO2 and Mrs. Bob MacPherson, Captain Jim Bendel, USN Ret, and Dr. and Mrs. Karl Ludwig. Without their generous support, we would not have been able to get this done. Members of the Navy League, Pittsburgh Council and the Reserve Officers Association, Sea Services Chapter Pittsburgh gathered at the Veteran's Administration Heinz Campus to thank the veterans and provide a great picnic lunch of hot dogs, home made baked beans, chips, cookies and watermelon. 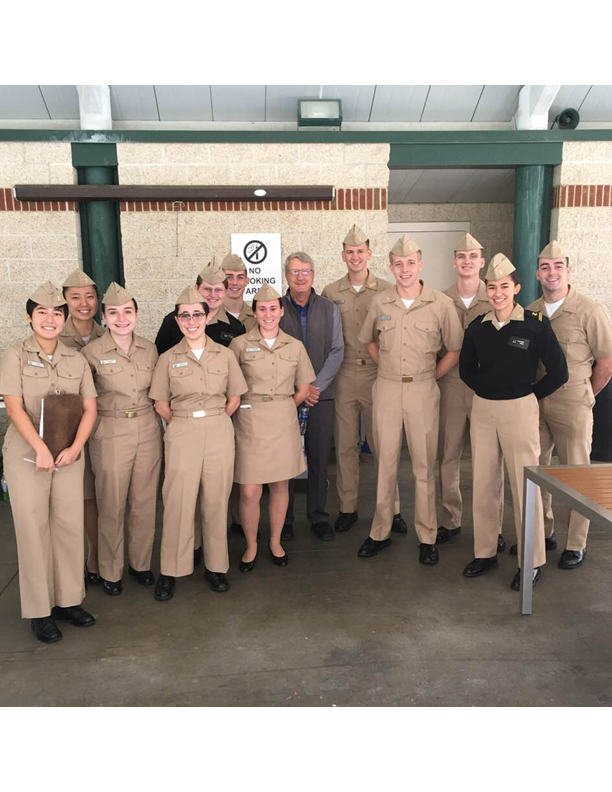 The Steel City Navy Reserve Officers Training Corps gathered the veterans from their rooms and brought them to the outdoor pavilion where they served the veterans lunch and listened to the many stories of service to our country. Thanks to all who participated. It was a gray and stormless day, but on June 1, 2018 52 ‘hearty’ golfers showed up at Butler’s Golf Course for a 10:30 AM shotgun start. We welcomed several ‘first-timers’ to our group. Skill prizes included four closest to the pin holes and two longest putt holes. High score (secret number) was attained by our Council President, Bob MacPherson. Don Elborne organized the outing for the 24th time; his able admin assistant this year was Polly Bozdech-Veater. Many special auction items and Chinese auction items were available. 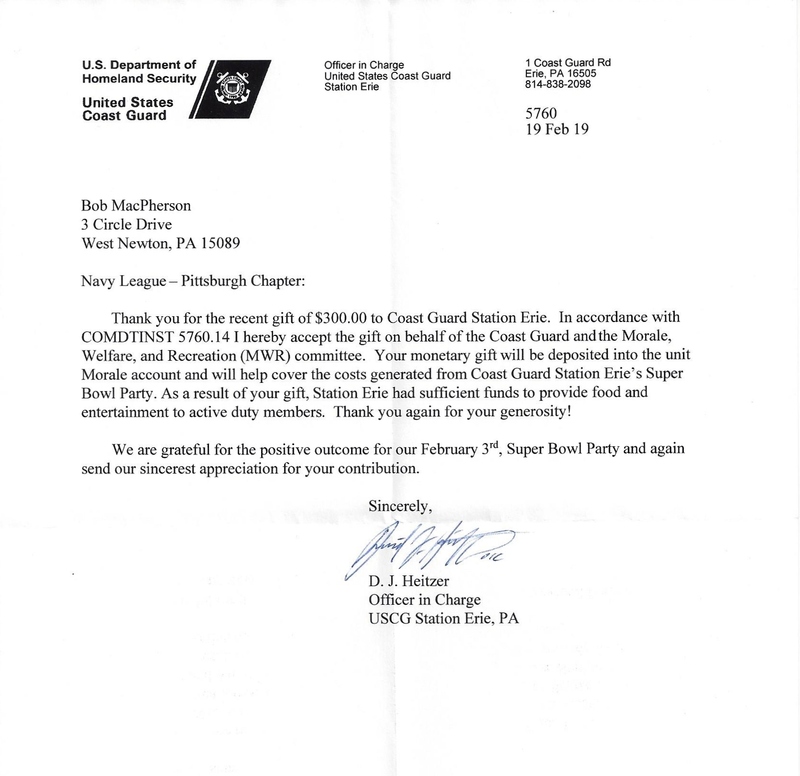 The preliminary results show a profit of over $2,700 for the USS Pittsburgh Children’s Christmas Party. In December 2015 our Board of Directors approved a significant revision to our Council Articles and Bylaws to mold our organization in support of our expanded vision. Here's a link to the new Articles of Incorporation [click here] and Bylaws [click here]. The Bylaws define new roles and responsibilities of the membership to lead us forward. We look forward to our council having a positive impact in support of the Sea Services.